This is the moment the former Top Gear crew turned heads in a village while filming their new TV show - driving a bizarre jacked - up Mercedes with enormous off road wheels. Jeremy Clarkson, 55, was behind the wheel of the modified 1970s car which apparently cruised up and down the high street in quiet Cobham, Surrey, (Thurs). Footage shows the presenter slowing down to ask onlookers "are you filming this car because it's excellent?" 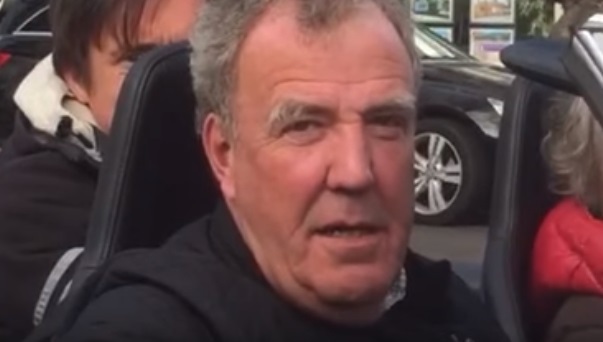 James May was in the passenger seat while Richard Hammond can be seen in the back seat, apparently exasperated over Clarkson's enthusiasm for the unusual vehicle. The trio are currently filming their new Amazon Prime TV program.